New Baby Chocolate Dipped Cake Pops are the perfect way to congratulate the new family on the birth of their baby boy. 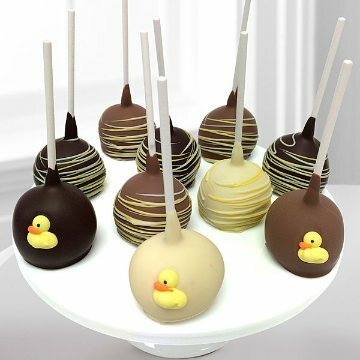 These delicious cake pops are hand-dipped in milk, dark and white Belgian chocolates, then drizzled with thin yellow and white confection ribbons and accented with chick candies. Containing an assortment of 10 pops including chocolate and vanilla cakes, this gift is a wonderful welcome for the new born. Each Cake Pop is individually wrapped for ultimate freshness. Arrives in an elegant gift box perfect for giving. This item includes the following: Ten assosrted cake pops.